Are you always in a hurry while travelling? Do you feel comfortable in face-to-face customer service situations or would you rather interact with a machine? For diverse reasons, more and more travellers are starting to appreciate the advantages of staying in a hotel with self-check in machines. Making use of this technological amenity comes with perks such as higher levels of privacy and the possibility of customising our stay, aside from the obvious time saving. In the first place, business travellers can go straight to the self check-in kiosk as soon as they step into the hotel and do their own check-in; the same happens when they need to check out quickly to leave for the airport and catch their flight. These two simple processes upon arrival and departure allow for greater independence and eliminate waiting times. Secondly, a guest who does not speak the local language will surely prefer to use the self check-in machine in order to be understood and avoid mistakes or delays. Digital kiosks in hotels let the user choose among a wide array of languages for an optimal experience. Furthermore, there are additional benefits to be enjoyed when we opt for the self check-in modality, as we may select our room from the available ones that correspond to the booked category by looking at the hotel floor plan. What is more, if we are members of the hotel chain loyalty program, we may even be given the option of upgrading our stay, add personalised orders and ask for the delivery of specific meals or amenities. Lastly, with the current privacy concerns, many guests will value the opportunity to input their personal info and bank details themselves instead of communicating them verbally to intermediaries. We are witnessing an increasing tendency in the implementation of both self check-in machines an online check-in through apps or websites for hotels. In order to process your own hotel check-in, you will typically be asked to touch the digital screen of the kiosk, select your language and enter the reference number of your reservation. If you are a member of the hotel chain loyalty program, input your user name and password: your reservation details will already be in the system. On the next step, your room number will be provided or you will be given the chance to choose the location of your room and customise it. In most cases, a reminder of the hotel policies will be displayed. If payment is required in advance, you can also do it at this point and get your invoice or sent it by mail to your main office (otherwise it will be made during the check-out process). And finally, the keycard to open the door of your room will be encoded and issued. Before leaving the hotel, you will return the keycard to the kiosk and make any payments generated during the stay. Those always on the go are prone to rely on digital apps and hotel websites to do their check-in online even hours before arriving at the accommodation since, in many cases, this virtual service is operational from the morning of the day of arrival. This process is quite similar to that of hotel self check-in machines, except for the fact that it requires prior registration and so is probably quicker, the guest having already saved relevant data like credit card numbers and special requests. The mobile key of your hotel room works just like a boarding pass downloaded to your smartphone. This modality is already available in most Hilton hotels across the world; if you do not have access to it, you can still do the online check-in and pick up your keycard from the hotel kiosk or the front desk. The Park Inn by Radisson Brussels Midi in Belgium is one of the hotels with self check-in machines in Europe that is making the journey of thousands of tourists and business travellers much smoother. With the possibility of a convenient fast check-in and check-out experience, the establishment offers 142 soundproofed rooms with high-speed WiFi right opposite Gare du Midi train station, and just 5 minutes from Brussels city centre. Additionally, guests enjoy an onsite restaurant serving hot meals and local beer and private car parking. Another hotel with self check-in kiosks for guests is the Jurys Inn Manchester in the very heart of this city of England. 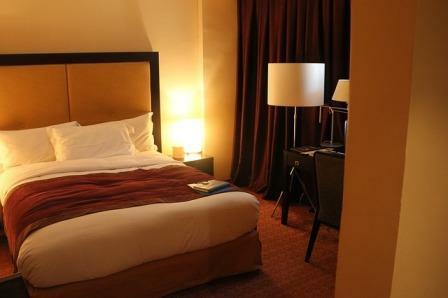 The hotel boasts 265 standard and executive rooms with views and equipped with comfortable beds and en suite bathrooms. Its varied buffet breakfast and the ultimate technology that has been implemented recently are held in high regard by travellers, who are particularly thankful for the sensation of safety provided by features such as lifts that can only be used with the encoded keycard issued at the check-in machines. The Double Tree by Hilton Dubai Business Bay in the UAE is one of the first hotels giving digital keys to their guests through the Hilton mobile app or online. On a truly privileged location near Dubai’s main attractions, the establishment offers free shuttle services to visit the Burj Khalifa, the Dubai Mall or to attend events at the Dubai World Trade Centre facilities. The area is full of shopping streets and restaurants, and the building does not only accommodate exceptionally ample rooms and suites with WiFi, but also 24-hour gym and lounge, a wellness club, business spaces and an outdoor swimming pool.